Ceiling pendants are designated for supply of medical gases, electric current and low current from the ceiling to the workplace of medical specialists. They are used especially for equipping of operating theatres, ARD, and ICU. 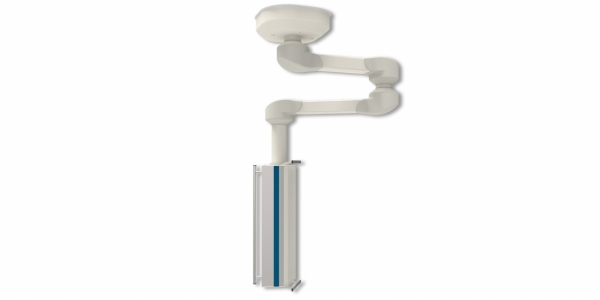 Rotary pendant is terminated by a source column and removable shelf is applied as a holder of medical devices. Rotary joints combined with horizontal and swing arm with electric drive enable any settings of the source column within a room. All the rotary joints of the arms are fitted with manually operated position interlock. The fixed placement enables any movement of the source column. 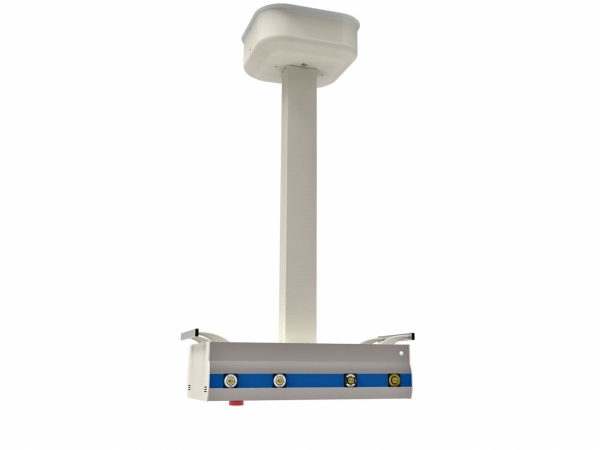 Special stationary ceiling pendants is designed for specialised workplaces, especially for medical treatment rooms and minor operating rooms.The source head of the ceiling pendants are equipped with electrical connections and gaseous media. Along both sides medical rail are lined. The outfall el. sockets, sockets weak current, X-ray and jack bush is performed in both cases from the rear of the source head. Connection gases including AGSS are solved horizontally. Ceiling pendants can be equipped with a wide range of accessories and gas outlet AGSS. The rotary placement enables 3 installation options of the source columns. 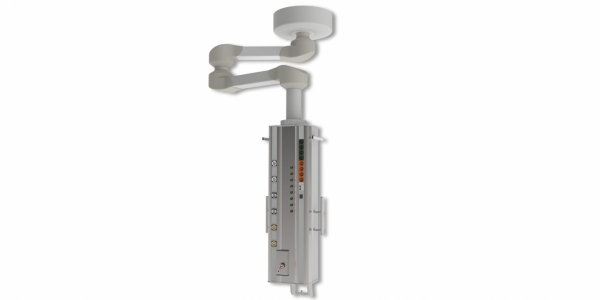 The OK07-05 type arm enable installation of the source column on a specific place, and its axial rotation. Source Surgical column (head) "A" is designed for ceiling pendants in operating rooms and other medical workplaces with high demands on technical equipment for supplying medical gases and electrical energy to medical staff on the workplace. 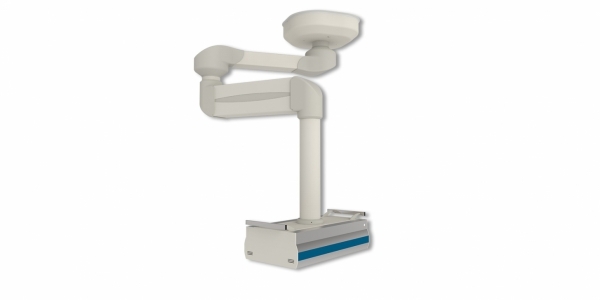 At the bottom of this source head is provided with two removable stainless steel rods, which can be attached vertically adjustable shelves, infusion rack or other equipment. The OK07-05 type arm enable installation of the source column on a specific place, and its axial rotation. 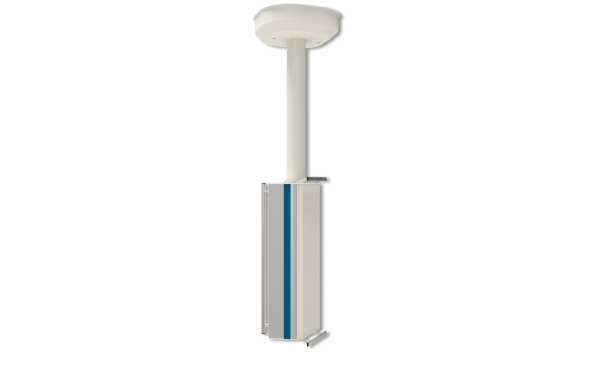 Source Surgical column (head) "L" is designed for ceiling stands of operating rooms and other medical workplaces with high demands on technical equipment for supplying medical gases and electrical energy to the workplace medic. In front is the source head equipped with two stainless steel consoles which can be equiped with height-adjustable shelves, racks infusion pumps, and other equipment. The OK07-16 type arms enable variable position setting of the source column in the horizontal level and its simultaneous circular movement, radius of which is given by length of the arm and with a possibility of installation of consoles with additional arms for optional accessories. Source Surgical column (head) "A" is designed for ceiling pendants in operating rooms and other medical workplaces with high demands on technical equipment for supplying medical gases and electrical energy to medical staff on the workplace. 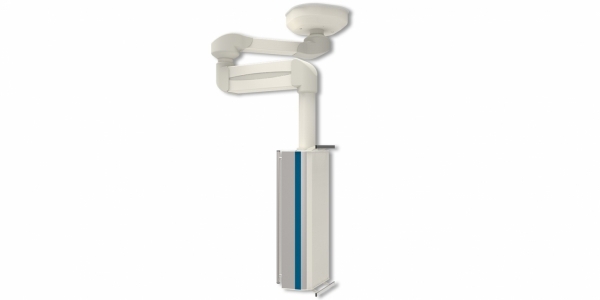 At the bottom of this source head is provided with two removable stainless steel rods, which can be attached vertically adjustable shelves, infusion rack or other equipment. 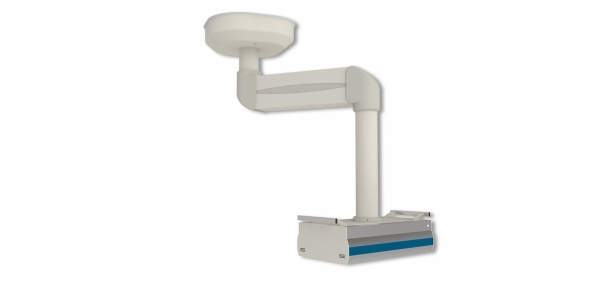 The OK07-16 type arms enable variable position setting of the source column in the horizontal level and its simultaneous circular movement, radius of which is given by length of the arm and with a possibility of installation of consoles with additional arms for optional accessories Source Surgical column (head) "L" is designed for ceiling stands of operating rooms and other medical workplaces with high demands on technical equipment for supplying medical gases and electrical energy to the workplace medic. In front is the source head equipped with two stainless steel consoles which can be equiped with height-adjustable shelves, racks infusion pumps, and other equipment. 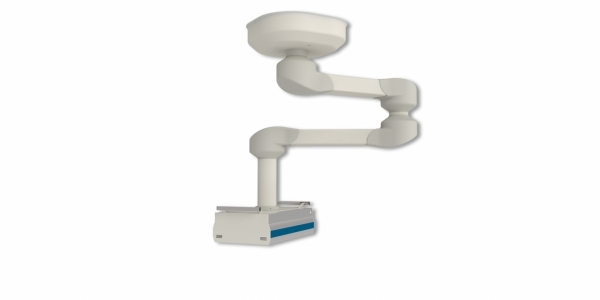 The OK07-28 type arms enable a possibility of variable position setting of the terminal column in the horizontal level, but also its setting anywhere within reach of the arms. Source Surgical column (head) "A" is designed for ceiling pendants in operating rooms and other medical workplaces with high demands on technical equipment for supplying medical gases and electrical energy to medical staff on the workplace. At the bottom of this source head is provided with two removable stainless steel rods, which can be attached vertically adjustable shelves, infusion rack or other equipment. The OK07-28 type arms enable a possibility of variable position setting of the terminal column in the horizontal level, but also its setting anywhere within reach of the arms. 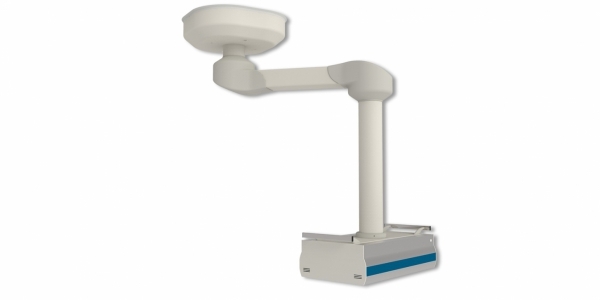 Source Surgical head "L" is designed for ceiling stands of operating rooms and other medical workplaces with high demands on technical equipment for supplying medical gases and electrical energy to the workplace medic. In front is the source head equipped with two stainless steel consoles which can be equiped with height-adjustable shelves, racks infusion pumps, and other equipment. The OK07-28 type arms enable a possibility of variable position setting of the terminal column in the horizontal level, but also its setting anywhere within reach of the arms. Source column (head) "Z" is the most frequently used in anaesthesiology section. Its advantage is possibility to suspend an anaesthesiologic machine on. This feature allows a permanent connection between that device and the source column when handled in the operation theatre and when this area is disinfected. Column fitting is optional as per individual needs of the workplace concerned.The source column can be fitted with different standard holders of anaesthesiologic device. Media outlets are set from the rearwall of the column. The height-adjustable placement enables 3 installation options of the source columns. Height adjustable complex is designed for specialised workplaces, especially for intensive care and AR. 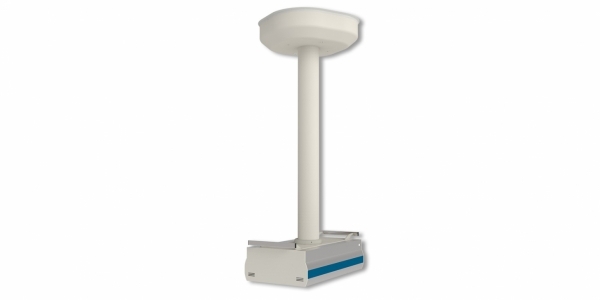 The source head is adjustable in height and is equipped with electrical connections and gaseous media. Can be equipped medical rail. The outfall el. soclets, sockets weak current, X-ray and jack bush is done on the rear side of the source head. Gas connection is done horizontally and AGSS vertically. The OK07-55 type arms enable variable position setting of the source column in the horizontal level and its simultaneous circular movement, radius of which is given by length of the spring arm. Source Surgical column (head) "A" is designed for ceiling pendants in operating rooms and other medical workplaces with high demands on technical equipment for supplying medical gases and electrical energy to medical staff on the workplace. 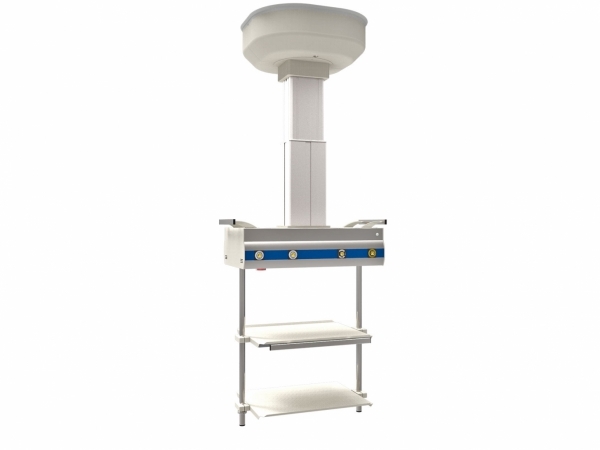 At the bottom of this source head is provided with two removable stainless steel rods, which can be attached vertically adjustable shelves, infusion rack or other equipment. The OK07-55 type arms enable variable position setting of the source column in the horizontal level and its simultaneous circular movement, radius of which is given by length of the spring arm. 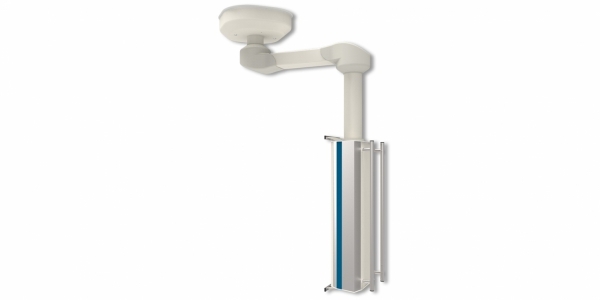 Source Surgical column (head) "L" is designed for ceiling stands of operating rooms and other medical workplaces with high demands on technical equipment for supplying medical gases and electrical energy to the workplace medic. In front is the source head equipped with two stainless steel consoles which can be equiped with height-adjustable shelves, racks infusion pumps, and other equipment. The OK07-57 type arms enable variable position setting of the source column in the horizontal level and its simultaneous setting anywhere within reach of the arms. Source Surgical column (head) "A" is designed for ceiling pendants in operating rooms and other medical workplaces with high demands on technical equipment for supplying medical gases and electrical energy to medical staff on the workplace. At the bottom of this source head is provided with two removable stainless steel rods, which can be attached vertically adjustable shelves, infusion rack or other equipment. The OK07-57 type arms enable variable position setting of the source column in the horizontal level and its simultaneous setting anywhere within reach of the arms. Source Surgical column (head) "L" is designed for ceiling stands of operating rooms and other medical workplaces with high demands on technical equipment for supplying medical gases and electrical energy to the workplace medic. In front is the source head equipped with two stainless steel consoles which can be equiped with height-adjustable shelves, racks infusion pumps, and other equipment.